Imagine you asked your finance team about how money enters and moves through your company, and they couldn’t tell you exactly where each dollar goes and is spent. You’d probably fire them all. So why aren’t a company’s users held to the same standard? Wealthfront VP of Growth Andy Johns receives a surprising number of blank stares and head scratches to this question. Johns has spent his career helping startups grow. He’s been a product manager and internet marketer at Facebook, Twitter and Quora, where he worked on growing their number of active users. Johns has deployed more than $10 million in online advertising spend, built email systems that sent over 50 million emails monthly and executed over 400 product A/B tests for user acquisition and retention. Simply put, he’s the renaissance man of growth. At First Round’s recent CEO Summit, Johns set out to help startups elevate their growth teams, via advice on hiring an exceptional head of growth and by helping founders sharpen their own growth chops. He mapped out what growth entails, outlined the three mandatory skills needed to be exceptional at it, and provided one-off lessons from his years in the field. Building growth models. Ask them how they’d build a model for your company’s main product to grow at scale. It can be basic, but should capture the core levers that explains how your company will grow (versus say, Facebook, Quora or Twitter). Developing experimentation models. Dig into how they’ve built testing and experimentation programs in a company. How have they organized a product design and engineering team around a testing schedule? Ask them to identify which experiments are most important and justify why. Building customer acquisition channels. 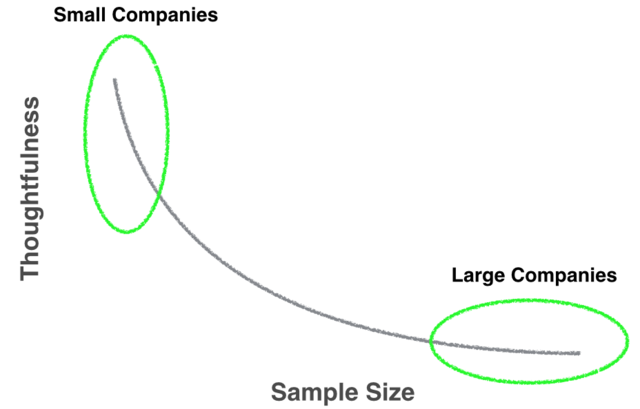 Can they identify, test and scale new customer acquisition channels? How do they choose from and cultivate different parts of the funnel? Top of the Funnel: In looking for a robust top of the funnel, what is being asked is: can the product capture traffic and convert it at an increasingly higher rate into some meaningful type of usage? This is a more tactical variable and the least important parameter in the equation, according to Johns. Core Product Value: This component involves the size of your market, the legitimacy of the problem you solve and how right you were with your product/market fit hypothesis. For products that get the “magic moment” and “core product value” right, the top of the funnel naturally and rapidly fills. And when you have tremendous top-of-the-funnel growth you don’t have to fight to fill it. You just need to remove friction where it exists. You’ve got a magic moment when how you frame what you do evolves from "I work on this" to "I get to work on this." Can They Develop Rigorous Experimentation Programs? Can They Test In Different Parts of the Funnel? 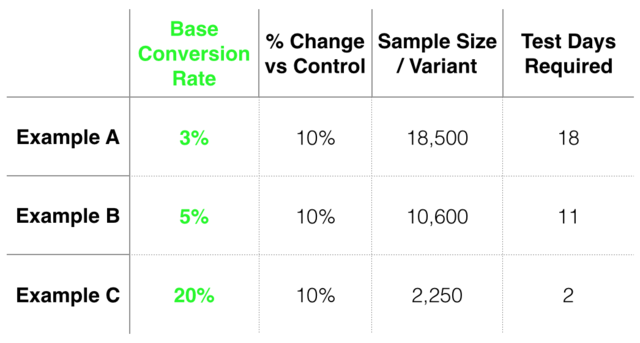 This chart looks at 3 A/B tests. 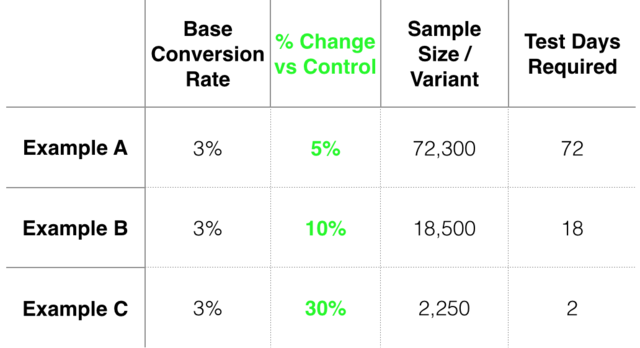 The base conversion rate just refers to the ultimate conversion rate of users executing an act you want them to do. 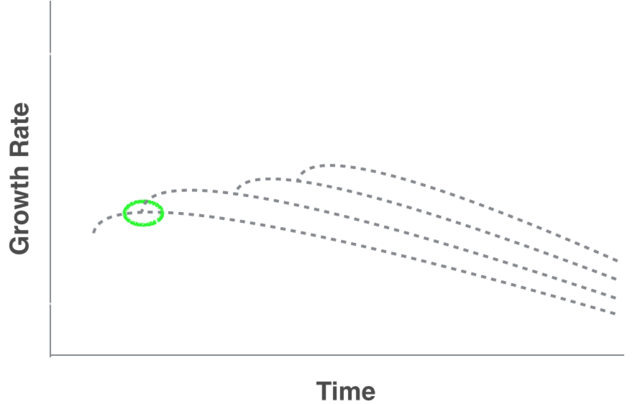 In this case, the focus is on the column in green, which captures the percent change over the control. So, for example, in Example A, a growth experiment was run and performed 5% better than the control that you’re testing against. Example C is 30% better. Testing rounded corners or 40 hues of blue won’t get the job done if you have small traffic sizes. Muster the courage to run experiments that can produce dramatic lift. Don’t hire a head of growth unless you have healthy organic growth first. The most meaningful product changes will come from a deep intuition and empathy for the user of your product. In order to establish an effective growth team and put an exception leader at its helm, a company must first demonstrate healthy organic growth. When it’s time to assemble a growth team, it’s critical that its leader can articulate the role of growth in the organization as well as have command over growth models, experimentation programs and various tests in the funnel. You’re looking for product-oriented, user-empathizing growth leader — not growth hacker.